Ru mentioned our friends who have been staying with us this week, and also the movie they made with WKG Creative about Dado Banatao called “A Farmers Son”, look out for the Surf Simply sequel next year! Harry mentioned his various GPS devices, and maybe we’ll do a longer feature on those in a future episode. Asher has been reading the History of Surfing by Matt Warshaw, and I can’t recommend that book enough for anyone who has enjoyed our Superhero of Surf features. Ru then mentioned that we’ve been sponsored by Firewire Surfboards, and that we’ll be getting a new quiver of boards for the resort soon, Thanks Firewire! Harry started the news by mentioning Mick Fanning’s shark “incident”, but more on that later. He then mentioned the planning application that has been put in for a new Wavegarden surf lake in London, England, which lead Asher to bring up the video that was released of the first waves being surfed at Surf Snowdonia which you can watch below, and Ru also mentioned Electric Blue Heaven, which was shot out in the Abu Dhabi wave pool. We then moved onto talking about the huge surf that hit Teahupoo in Tahiti last week, with great rides by Keala Kennelly and an amazing wipeout for Niccolo Porcella. We also mentioned Jamie O’Brien setting himself on fire, and Ru brought up the Surfline SlideShow of the best photos. That took us to mention the US Open of Surfing, and the Duct Tape Invitational, before moving onto the roundup of the J-Bay Open event from last week. After the shark stopped the event, the points and prize money were split between Julian Wilson and Mick Fanning. Derek is a Marine Biologist who works at Nova Southeastern University in Florida for the Guy Harvey Research Institute, and also works for Save our Seas and Sharks 4 Kids. We showed him this video of Mick Fanning and the shark in order to get his opinion on what was going on. 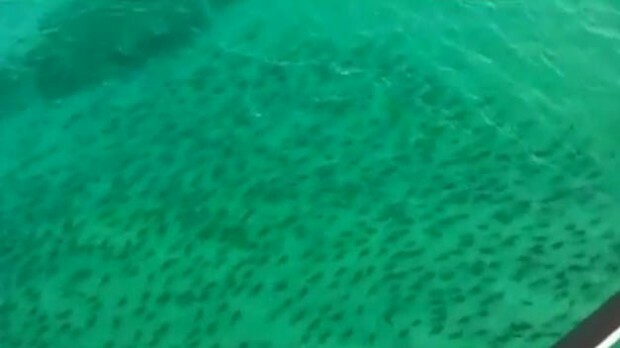 During the interview he referenced the Elasmo Banks Society and this photo of over 1000 sharks in a single photo taken off the Florida coast. Ru brought up Hamish Jolly’s Ted Talk from a few years ago, as well as Shark Shield as being examples of dubious shark deterrents and Harry brought up the Western Australian Shark Cull which caught 163 tiger sharks but no Great Whites. We also spoke about tagging and tracking sharks in the wild, and you can view the tracking data HERE, as well as a paper on the numbers of sharks being killed worldwide which you can read in full HERE. Harry brought up the REDirect Surf 2015 video contest. The voting is now open so go and choose your favorite video. He also mentioned this video of the Wavegarden facility in Spain lit by underwater lights. Asher has been enjoying Dane Reynolds’ new movie “Dolores Raw”.